The best leaders understand that the current success of their business, and any future innovation, depends upon the "deep smarts" of their employees — the business-critical, experience-based knowledge that employees carry with them. Leaders with a passion for developing employees' skills, and those who understand the need to transfer knowledge among generations of workers, know how important it is to link in-house education to strategic planning. The key to innovation is combining old and new perspectives to make something better. “Make Yourself an Expert,” Dorothy Leonard, Gavin Barton, Michelle A. Barton in Harvard Business Review, April, 2013. Tips and tools for climbing the ladder of expertise. “Deep Smarts™”, Dorothy Leonard and Walter Swap, in Harvard Business Review, September, 2004; Reprint #7731. This article presents many of the key concepts about experience–based, business–critical expertise that were explained at much greater depth in the book by the same name. “Learning When to Stop Momentum”, Michelle Barton and K. Sutcliffe, in MIT Sloan Management Review, 2010. 51 (3), 69-76. This article was an Academy of Management Finalist for Outstanding Practitioner–Oriented Publication in Organizational Behavior. The authors describe how to avoid the “dysfunctional momentum” that leads to failure–and even disaster. “The Role of Tacit Knowledge in Group Innovation”, with Sylvia Sensiper, in California Management Review, Vol. 40, No. 3, 112-132, Spring 1998. This article has been	reprinted many times in books because of the insights it provides into the way that the tacit (i.e., unarticulated) knowledge possessed by group members shapes their innovations. “Putting Your Company's Whole Brain to Work”, Dorothy Leonard and Susaan Straus, in Harvard Business Review, Vol. 75, No. 4, 110-122, July/August 1997. Reprint #97407. 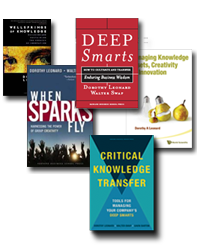 Reprinted extensively in books on knowledge management and also innovation. “Core Capabilities and Core Rigidities: A Paradox in Managing New Product Development” Dorothy Leonard in Strategic Management Journal, Vol. 13, Summer Special Issue, 111-125, 1992. In 2002 this article won an annual award for having the most lasting and significant impact on the field over a ten–year period. “Knowledge and the Management of Creativity and Innovation”, Dorothy Leonard and Michelle Barton, in M. Dodgson, D. Gann and N. Phillips, eds. The Oxford Handbook of Innovation Management. Oxford, UK: Oxford University Press, 2012.